As we all know, this has been a long, frustrating, mostly inactive offseason for the Mets. After a 92-loss season, they have done little to improve a pitching staff that finished with the second-worst ERA in the National League last year, other than the fairly risky signing of 32-year-old Anthony Swarzak. They have holes or uncertainties at every position in the infield to some degree and have created a five-man outfield logjam with five starting caliber, but injury-prone outfielders outside of Jay Bruce. There are countless paths the Mets could take to try and build a competitive roster, but that’s a topic for another time. 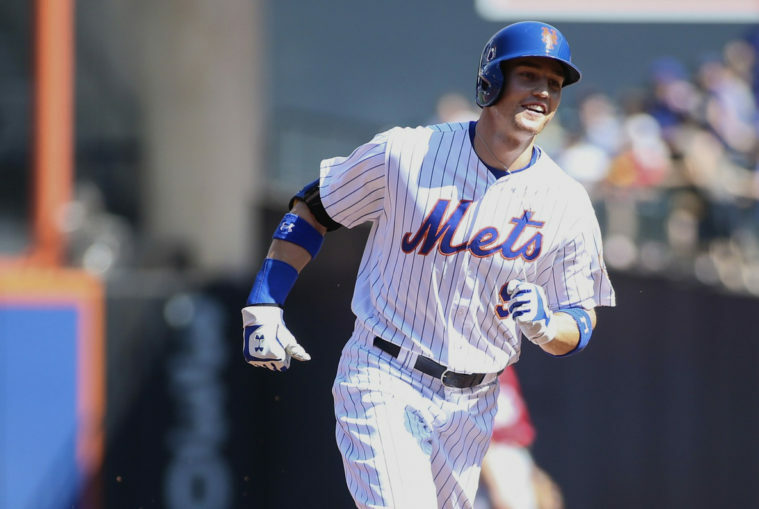 What I want to get into is a certain player who must be given a fair chance at a starting role, and that is 24-year-old outfielder Brandon Nimmo. A first round pick from 2013, some considered Nimmo a disappointment due to his lack of flashy tools, despite solid numbers throughout the minors. He always maintained a healthy OBP due to his high walk rate and solid contact ability. After a great 2016 season in Triple-A where he put all his tools together to hit .352/.423/.541, he put up a sub-par but not horrible 88 wRC+ in his first 80 plate appearances in the Majors. Nimmo started to swing the bat more that year, so while his walk rate decreased a little bit, he hit a career-best .352 and still had a spectacular .423 OBP. He also hit for the most power he had ever hit for in a minor league season, and while some of that may be attributed to the hitter-friendly Pacific Coast League, it was still very encouraging and suggested that Nimmo could develop into a quality Major Leaguer. With the Mets having a rough 2017 season, Nimmo’s playing time began to increase more and more throughout the year, and he made the most of it. The main thing about Nimmo that was so impressive was his consistent ability to have good at-bats. He has an elite eye at the plate and a unique ability to lay off almost any pitch outside the strike zone. In fact, among hitters with at least 210 PA last year, Nimmo had the fifth lowest O-Swing percent in all of baseball. He also had the 10th best walk percentage in baseball, behind names such as Joey Votto, Aaron Judge and Mike Trout, and ahead of names such as Josh Donaldson, Kris Bryant and Paul Goldschmidt. He quietly was one of the most disciplined hitters in the league. Another encouraging sign for Nimmo is how his power developed as the year went on. Never known as a slugger, he showed very little power in his brief 2016 stint with the Mets, and that continued into 2017 as he had just one extra-base hit in his first 25 plate appearances. His power started to rise in August when he recorded a more respectable .100 ISO while hitting his second career home run (first of the year) along with three doubles, but his power output really started to rise in September and October, when he got the chance to play everyday and put up a .219 ISO, which is not only respectable, but above average. To put that into perspective, Chris Davis, Justin Turner and Jose Altuve all had ISOs lower than .210 in 2017. Now, I’m not saying that Nimmo will ever have as much power as those guys, but it’s really encouraging to see how his power developed as he got more comfortable with Major League pitching, and is a sign of his potential for the future. One thing that could be improved about Nimmo’s game is his tendency to strike out. He struck out 27.9 percent of the time, which isn’t terrible, but it is a tad high, and improving this facet of his game would make a huge improvement overall. He didn’t strike out because he was chasing pitches or swinging wildly. As I mentioned earlier, Nimmo has one of the best eyes at the plate in all of baseball and has a simple, compact swing. The fact of the matter is that Nimmo may have actually been somewhat too selective, as he swung at only 59.3 percent of pitches inside the strike zone, compared to the league average 66.7 percent. In the rare times that he did swing outside of the strike zone, he made contact 7.6 percent below average. When he swung at pitches in the zone, he made contact at roughly a league average rate, so there’s some room for improvement there as well. While Nimmo does have some strikeout problems, his are much more easily fixed than the typical young player who comes up and slashes at everything in the dirt since Nimmo already has a great knowledge of the strike zone. Contact isn’t a huge problem, his contact rate was one percent above average, it’s really just knowing when to take a hack at a hittable pitch, which is something that can definitely improve over time, especially for a hard-working, intelligent young hitter such as Nimmo. With an improved strikeout rate, I could see Nimmo hitting for a higher average in 2018 even if his BABIP dips, which would add to his already impressive OBP. But now to get to my main point, which is that the Mets need to give Nimmo a chance at an everyday role despite having five capable outfielders on their team. In his 215 PA last year, he hit .260/.379/.418 with a 117 wRC+. Granted, he did have a somewhat high .360 BABIP that will likely regress, but Nimmo is someone who has been able to post high BABIPs in the minors, so maintaining an above-average BABIP is certainly feasible. His .158 ISO is only slightly below league average, and the improvements he showed throughout the season suggest that he may even be able to add a little power in the future. Add league-average power to a great OBP, decent baserunning and passable defense, and you’ve got a starting caliber player. Something that I think is getting overlooked, however (besides his surprisingly not-awful power), is just how valuable his ability to get on base is, and why the Mets need this guy at the top of the lineup consistently. His 117 wRC+ was identical to Carlos Santana, Trey Mancini and Yasiel Puig, and was just one point behind Jay Bruce and Francisco Lindor. It was also higher than players such as Christian Yelich, Lorenzo Cain, Neil Walker, Lucas Duda and Ryan Braun. Getting on base is one of if not the most valuable skill there is to have as a hitter, and it is something in which Nimmo excels. Watching him for the past couple years now, he seems to be constantly improving, leading us to believe that there is more in store for the soon-to-be 25-year-old. His 1.1 WAR stretched out to 550 PA equates to a 2.8 WAR, which is above average for a starter and higher than what the recently re-signed Bruce put up last year in 619 PA. In fact, an argument could be made for starting Nimmo over Bruce, due to the fact that Nimmo provides much better value on the bases and in the field, where he can play all three outfield positions. Regardless, the Mets need to realize that they have a quality player developing here, and in my opinion, it would not be wise to trade him considering his potential and five years of control left. If I were the Mets right now, I would have him be my Opening Day center fielder. The Mets need to play Nimmo, and they need to bat him leadoff. Michael Conforto is a great hitter, but he’s not a leadoff hitter. Amed Rosario is not a leadoff hitter. Asdrubal Cabrera is not a leadoff hitter. Nimmo, however, is the embodiment of an ideal leadoff hitter which is someone who works the count consistently and gets on base. 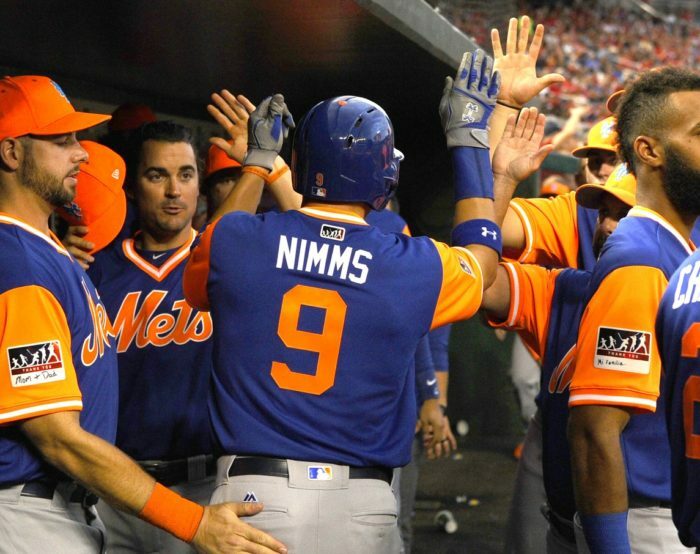 They may platoon him with Juan Lagares, which is understandable considering Nimmo has struggled against lefties so far in his career and Lagares brings elite defense to the table, but no matter what, Nimmo has done more than an adequate job of proving that he is someone worth giving a chance to. Let’s hope for even more improvement from Nimmo in 2018. Thanks for reading! 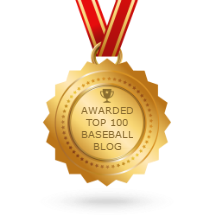 If you enjoyed this article, you might want to check out my analysis of Kershaw’s postseason struggles, or if you like interviews, Mike has plenty of those. You can also follow us on Twitter and Instagram for updates on when we publish a new article or interview. You can also follow me on Twitter.